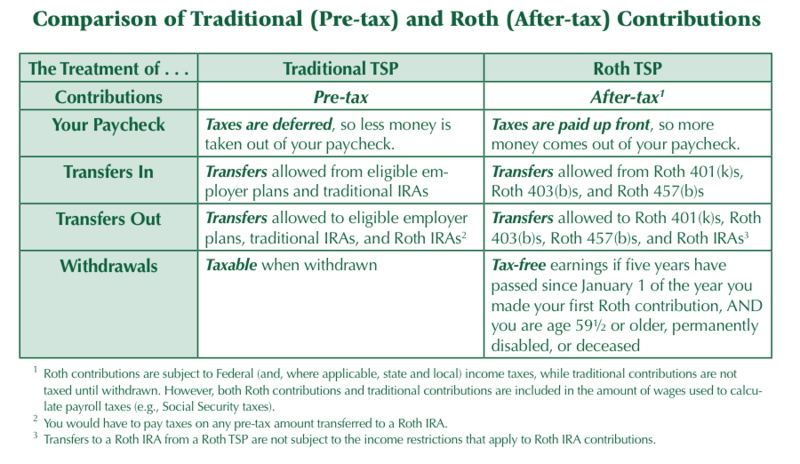 Most of us have by now received mailings and leaflets highlighting the coming Roth TSP option for TSP contributions. Unlike the other TSP funds, this is not a different type of stock or bond fund, but rather a different choice in how your current contributions to the TSP are taxed, which will determine if your withdrawals are taxed or not after you turn 59 ½. If you choose to contribute to the Roth TSP, your contributions will be made after taxes have been deducted. Regular TSP contributions are made before taxes are taken out of your paycheck. If you have paid taxes before contributing (the Roth option), then your withdrawals after you retire/turn 59 ½ will be tax-free. If you have not paid taxes before contributing (the regular option), then you will pay taxes on the amount you withdrawal after you retire/turn 59 ½. Since Roth contributions are made after taxes are deducted, your taxable income will be higher than if you contribute to a regular TSP account. Thus if you periodically contributed $500 to a regular TSP account and wanted to contribute that same amount to a Roth TSP, you would now need to pay taxes on that $500 first before contributing to a Roth TSP account. That would reduce the original $500 by up to a third depending on your income, tax bracket, number of deductions/dependents, etc, potentially dropping that $500 to $350-$400 after taxes. You would therefore need to come up with an extra $100-$150 or so to make up for the amount taken by taxes. And, for higher-income individuals and families who are not eligible to contribute to a Roth IRA, the Roth TSP is not subject to income limits. So anyone can contribute to the Roth TSP. See the video describing the Roth TSP here. See the “Roth TSP Contributions” post for a strategy on how to switch from regular to Roth TSP contributions.